Shelters allow you to store items such as bicycles or bins effectively, keeping them dry from the weather and in a safe, secure designated area. They can also be used in waiting areas and at bus stops to keep penetrations dry whilst waiting for a bus or to pick up their children from school. Please read through the FAQ’s below to find out more about our shelter range, if you cannot find an answer to your question, please contact us and we will be happy to help. 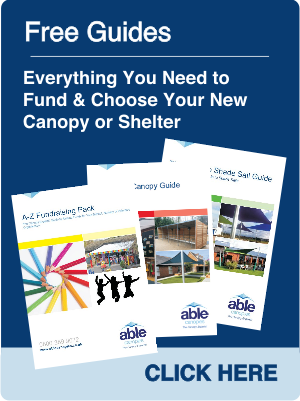 Once you have decided to order your shelter from Able Canopies, we can discuss the available installation dates. The time scales offered, vary depending on current availability; we are at our busiest during the school holidays and therefore lead times may be slightly longer during these busy periods. We do however, always endeavour to get your shelter installed as soon as possible. The actual installation usually takes just one day, depending on the size of the shelter. What materials are your shelters made from? How do I choose the right shelter? We have designed a range of five shelters to suit every budget. If you are interested in a specific shelter, we can supply a free quote for this. If you are not sure which shelter is best for you, we can provide you with a price for each option to give you a better choice. We also offer a range of cycle compounds for those that wish to offer a larger, secure cycle storage area within their grounds. Do we need a hard stand for our shelter? Yes, we can only fix our shelters to a hard stand such as a concrete base. You may already have a hard stand which the shelter can be fixed to. If not, we will be happy to supply a quote to carry out this work for you. Why do you need to know the location that I would like the shelter installed when I request an estimate? We always ask for an address as this helps us to price for you more accurately. We are able to offer supply only on certain products, please contact us if this is something you require. Can you advise on routes to funding? There is a lot of funding available for cycle shelters at schools at the moment. There is a section on our website has a list of funding opportunities for cycle shelters. Our shelters are supplied with different guarantees each, reaching up to 10 years for some. How do we maintain our shelter? To maintain your shelter, we recommend that you periodically clean all metal components, polycarbonate panels and glass panels with warm water and a non-abrasive cleaner. Can a shelter be moved after installation? Yes, the price we quote includes the product, full installation and removal of rubbish unless otherwise stated. What colour can I have my shelter? Many of our shelters can powder coated to any RAL colour, however some are limited to specific range of colours please see the spec on the product page or contact us. With our shelter systems, you always get excellent value for your money. We provide systems which offer quality and longevity at excellent value. How much disruption will you cause during the installation of the canopy? You will hardly even know we are there! 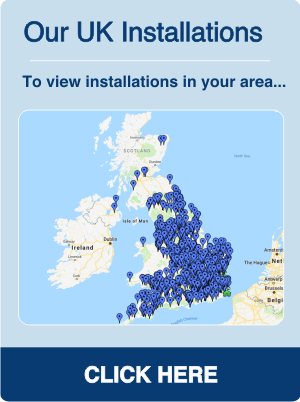 Most of our products are already assembled to minimise onsite disruption to your site on the day of the installation and will always leave the site clean and tidy upon completion. Does the shelter have any other uses? The shelters can be used as cycle, waiting, buggy, bin, shopping trolley, smoking, storage, bus and pay and display shelters which can all be used in a variety of applications. The surface we would like a shelter fixed to is uneven; can we get around this? Yes. All our shelters have adjustable feet which enables us to fit our shelters to uneven surfaces. Do you supply any accessories and upgrades? Yes, we can install a secure lockable door on the front of the shelter which provides added security. We can also supply accessories such as lighting, visibility stickers for the glass panels and benches and smoking tables. 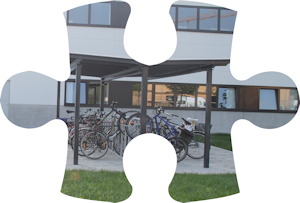 How many bikes can you store in a shelter? How can I find out more information about your shelters? 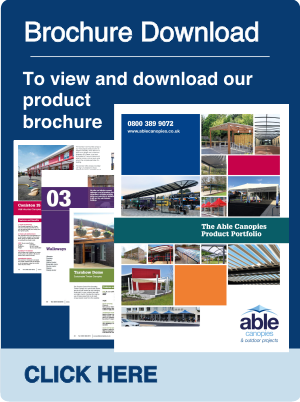 Click here to find view our full range of shelters; alternatively you can download our brochure.